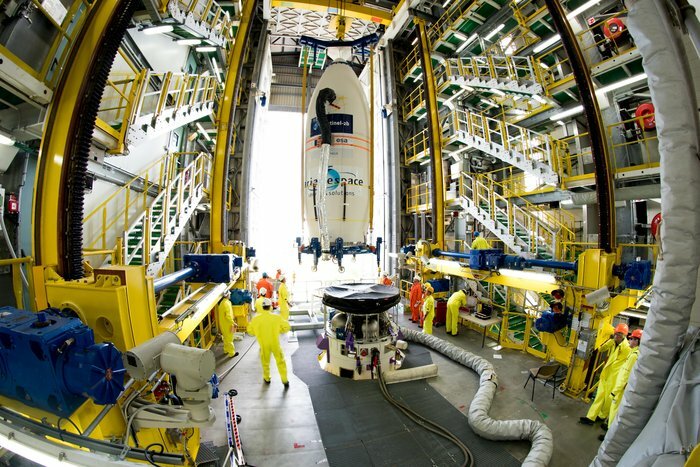 The satellite was encapsulated inside the Vega rocket’s Swiss-made composite nose shroud Feb. 15, then transferred to the Vega launch pad Feb. 18, where the four-stage booster was already assembled and awaiting the arrival of the payload. 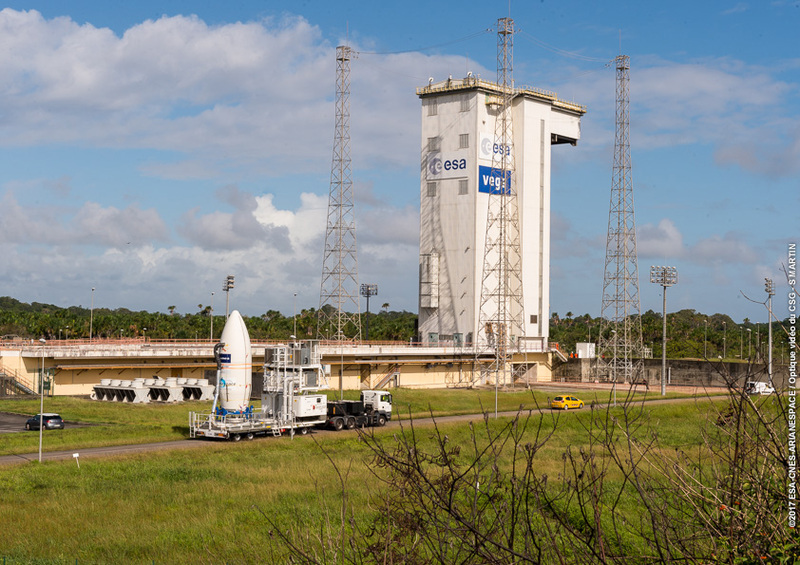 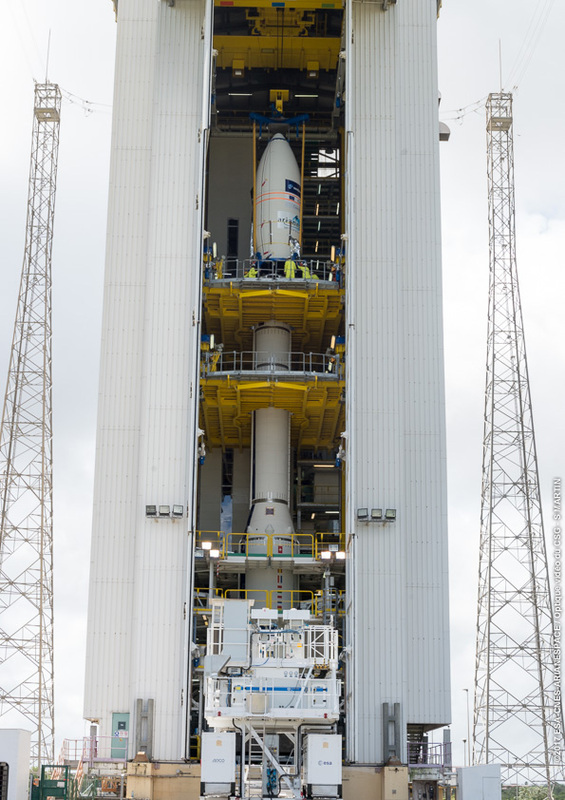 Sentinel 2B is scheduled to lift off at 0149 GMT March 7 (8:49 p.m. EST March 6) on top of the Vega rocket, which will fly on its ninth mission since debuting in February 2012. 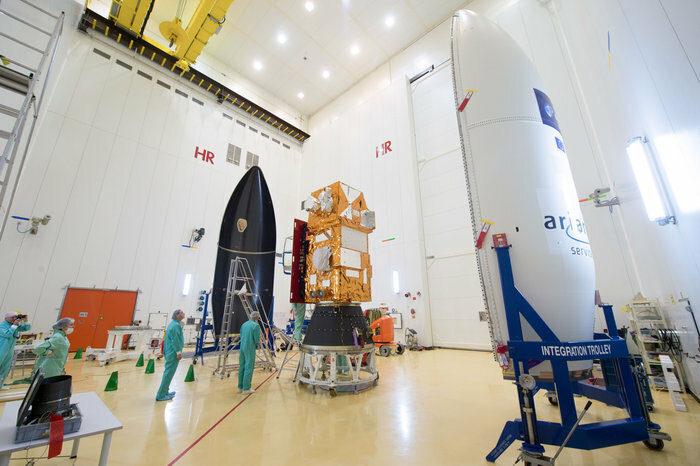 Next month’s launch will be the third Arianespace mission of the year, and the first Vega launch of 2017. 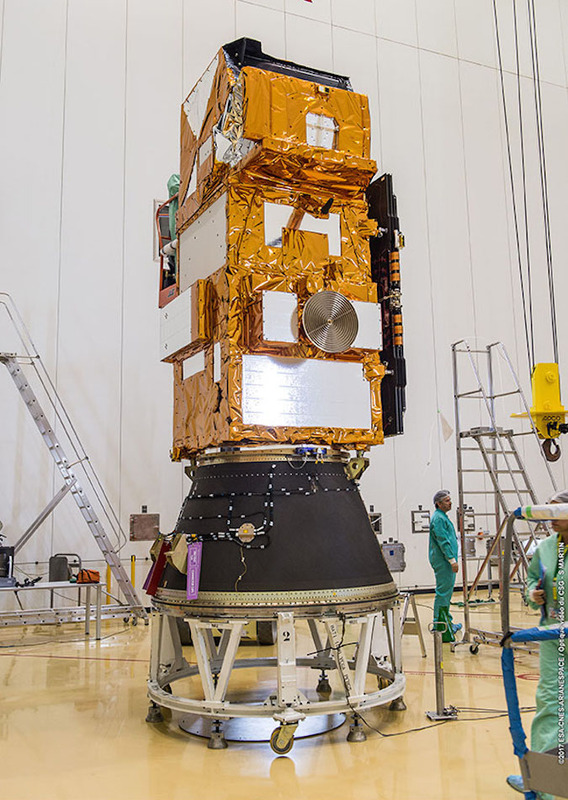 The Sentinel 2B spacecraft carries a sharp-eyed camera — sensitive to 13 different nuances of color — designed to paint a broad swath 180 miles (290 kilometers) wide as the satellite circles Earth in polar orbit at an altitude around 488 miles (786 kilometers) above the planet. 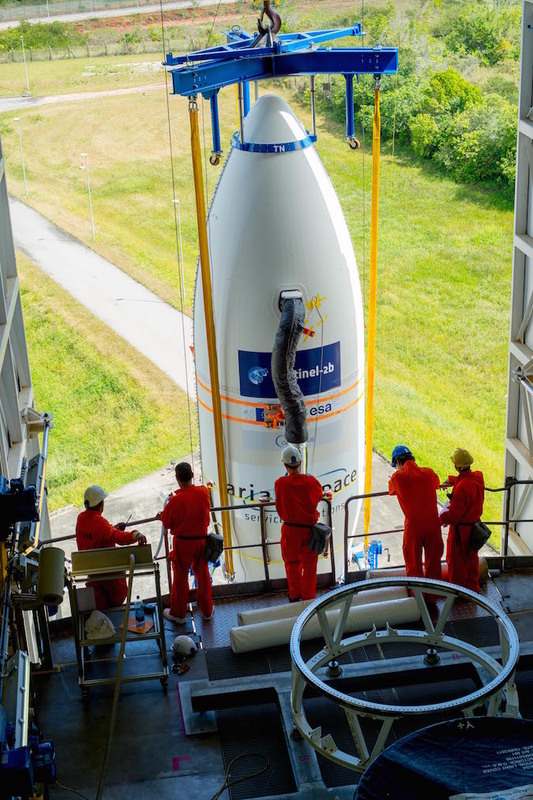 Built by Airbus Defense and Space, Sentinel 2B follows the identical Sentinel 2A Earth observatory launched in June 2015. 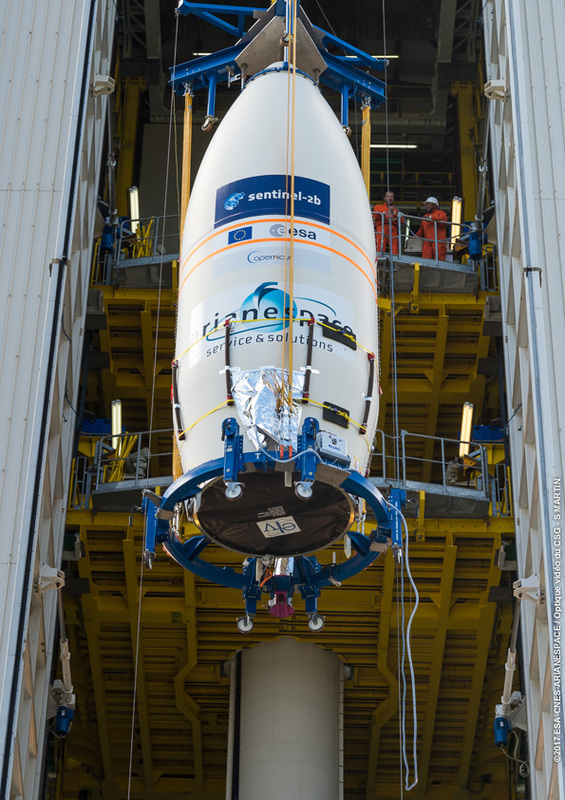 With two Sentinel 2 platforms in orbit, users will be able to glimpse the same location on Earth every five days. 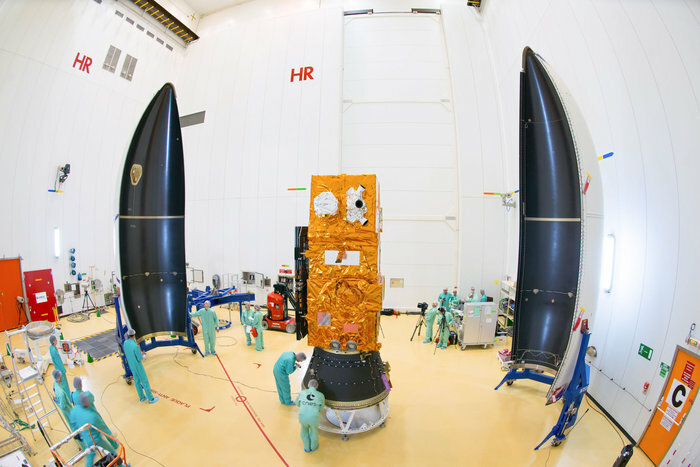 The European Commission’s Copernicus program has several lines of Sentinel satellites. 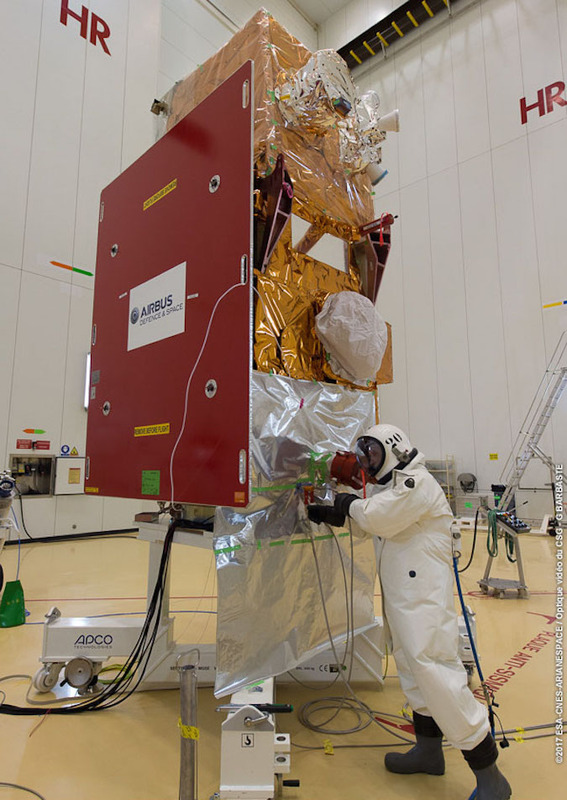 While the Sentinel 2 series is devoted to land imaging — roughly equivalent to the U.S. government’s Landsat missions — other Sentinel satellites carry radar and atmospheric sensors to monitor pollution, ice sheets, oil spills and other environmental concerns. 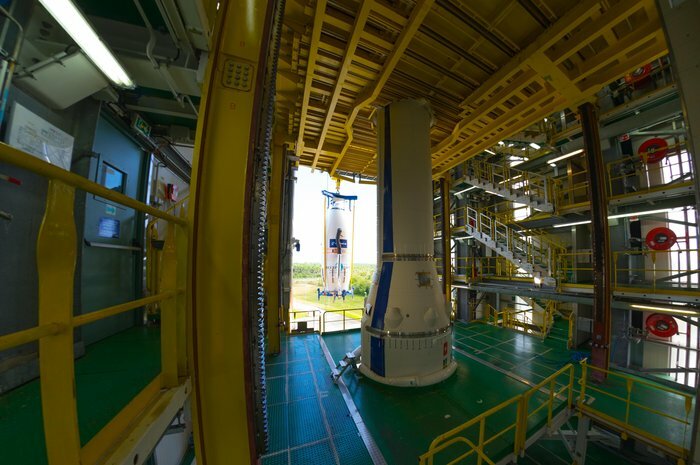 Sentinel 2B will be the fifth Copernicus satellite launched overall since the Sentinel deployments began in 2014. 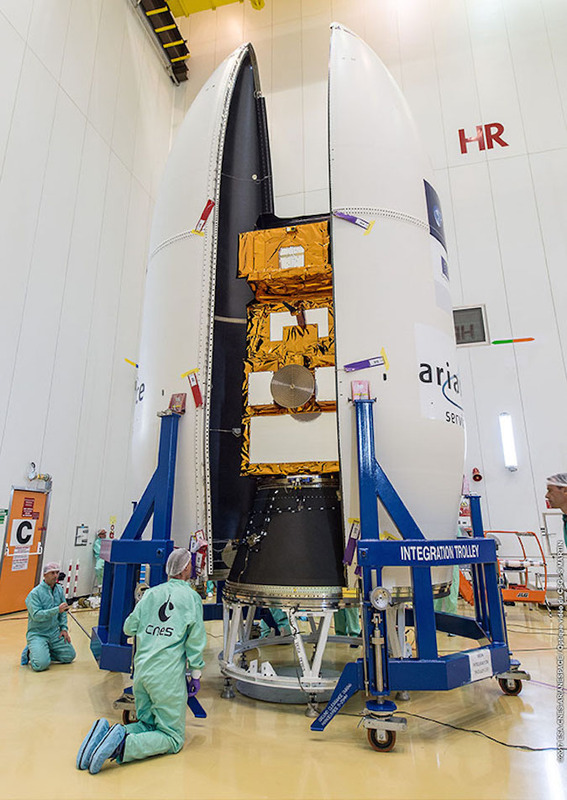 ESA manages the satellites and launches for the Copernicus program on behalf of the European Commission, the EU’s executive body. 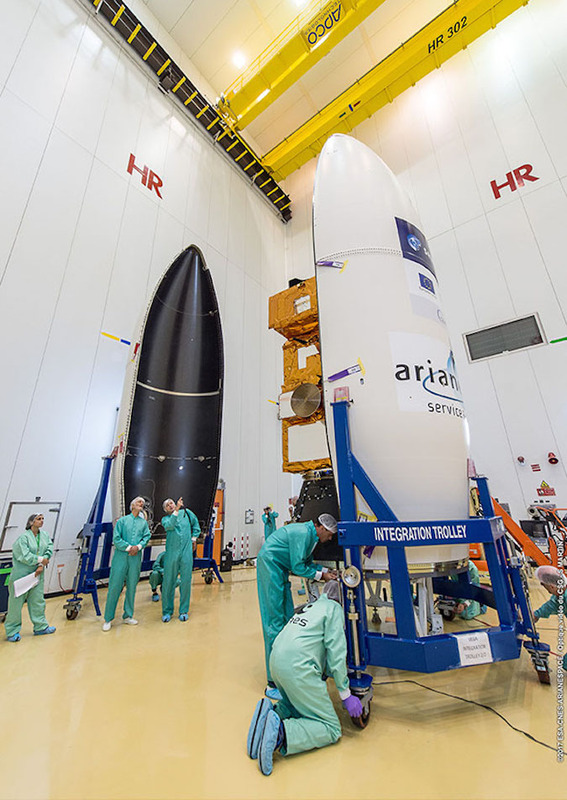 The satellite was fueled with its supply of in-orbit maneuvering propellant before encapsulation inside the Vega rocket’s payload fairing, giving Sentinel 2B a launch mass around 2,500 pounds (about 1,140 kilograms). 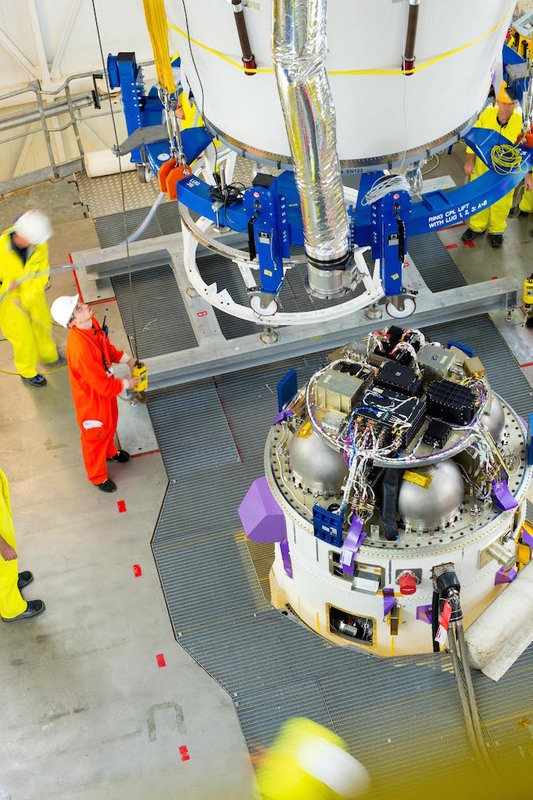 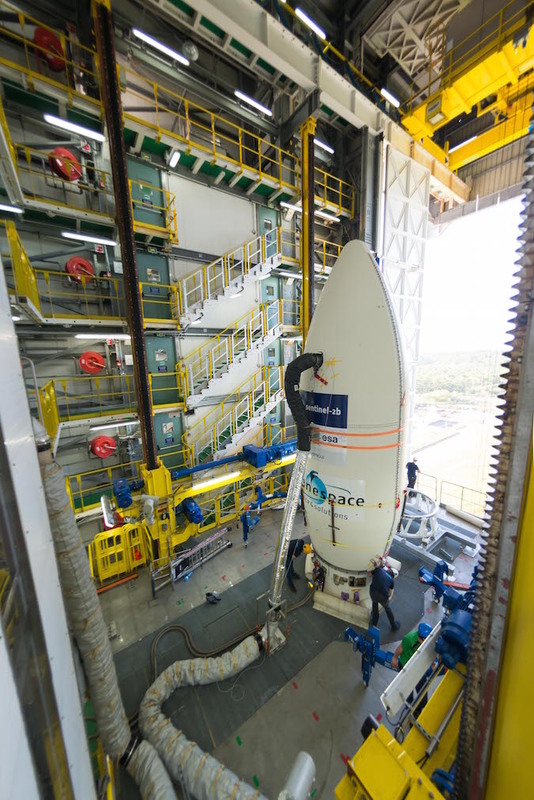 Once hoisted into the Vega launch pad’s mobile gantry, the fairing and Sentinel 2B were lowered on top of the rocket’s fourth stage. 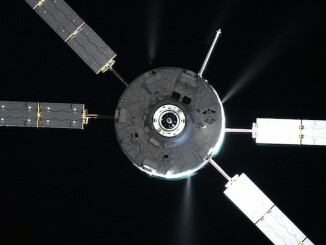 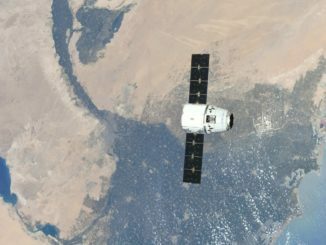 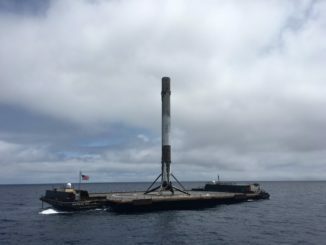 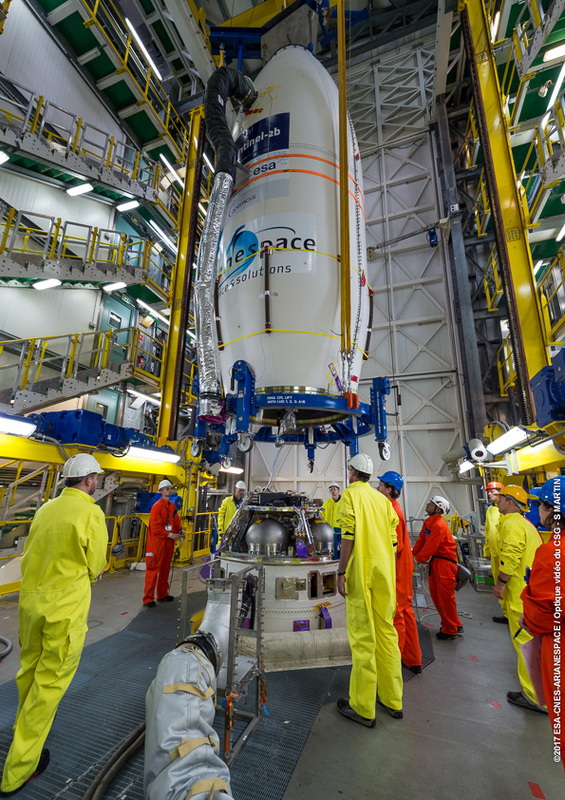 Ground crews successfully completed functional checks of the satellite Feb. 19. 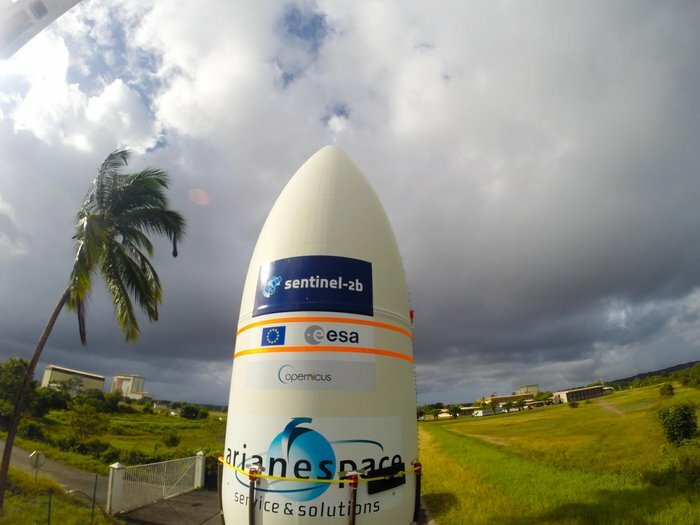 Sentinel 2B is designed for a mission of at least seven years. 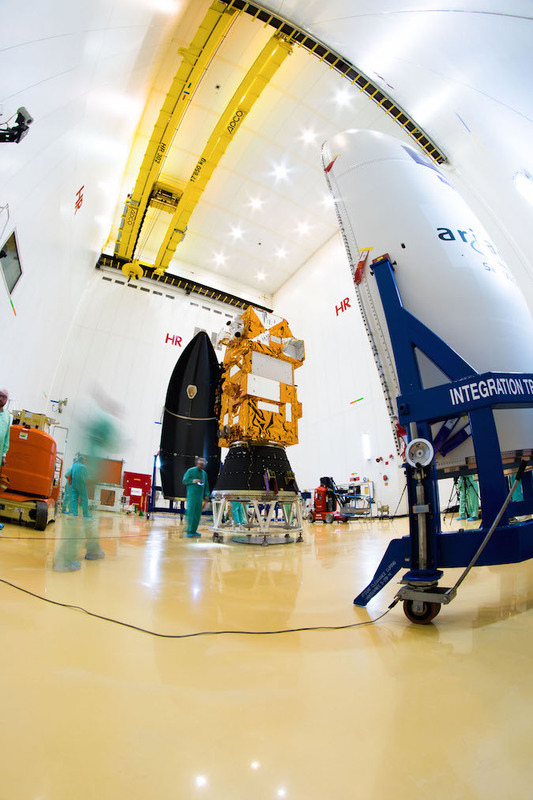 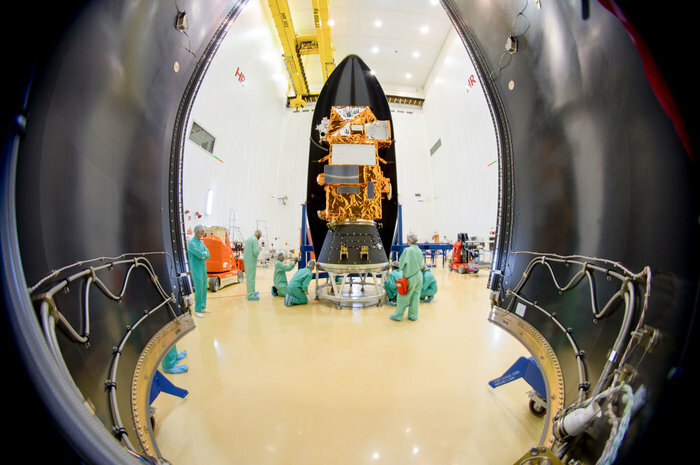 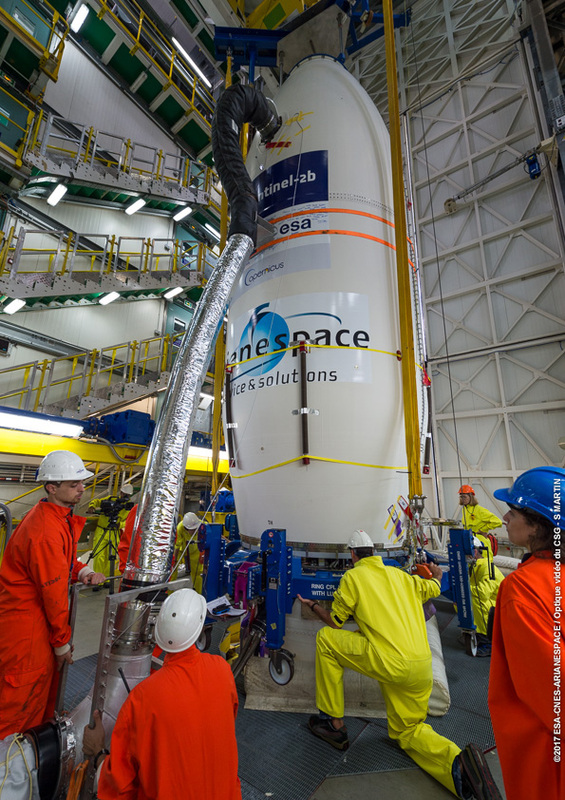 The images below show fueling of Sentinel 2B, encapsulation of spacecraft inside the fairing, and its arrival at the Vega launch pad before attachment atop the 98-foot-tall (30-meter) rocket.